This year’s end of term parties are everywhere you look at the moment, so we thought we’d put together a handy guide to help you make your mind up on where you’re gonna don your shades and fades. Get digging! The end of year festivities begin with Saul’s Session’s biggest booking to date: Chicago’s highly reputable funk and soul selector, Sadar Bahar. After decades of respect in the rare groove scene and an inspired set at Dekmantel Boiler Room, Bahar has become a very hot booking of late – and the Harley is sure to be a wise choice to kick off your week. If 140+ bpms are your thing, look no further than this triple collab of bass madness from Bluewave, Mud and Displace. Rinse FM’s Sir Spyro heads up the grime in room 1, while DJ Hatcha rolls through a 15 years of Dubstep set in room 2. Room 3 is dedicated to liquid D’n’B, with bashment/dancehall also making an appearance in the form of producer-of-the-moment Murlo, not to mention a ‘Bumbaclart BBQ’ and mad carnival decor everywhere you look. Pretty Pretty Good’s penultimate party of the year brings one of the biggest names in techno the Harley has ever seen. Berghain resident Levon Vincent’s self-titled album received rave reviews across the board last year and after an explosive set headlining Hope Works at Tramlines 2014, he’s sure to turn the intimate Harley into a sweatbox you’ll want to be right in the middle of. AND you can hear PPG’s new mix series here. Disco, house & techno promoters Percolate finally make their Steel City debut at The Night Kitchen, after 4 and a half years of throwing some of the best parties the UK has to offer. Their residents Krywald & Farrer are joined by Hessle Audio linchpin, Pearson Sound and Washington DC duo Beautiful Swimmers, who are gaining serious attention with their pioneering labels Future Times and World Building. What better way is there to kick off your summer than to whack on a Hawaiian shirt and boogie to your favourite disco bangers? Combine two of our favourite things: Nice Like Rice and Miami Vice and that’s what you get. Now in its 6th edition, this party does exactly what it says on the tin. What’s more, it’s only £4 in with a Hawaiian shirt. Ballin’. Back for the 4th year in a row, TTC’s end of term bash is always a roadblock, with 12 hours of live music and DJs across 4 venues. 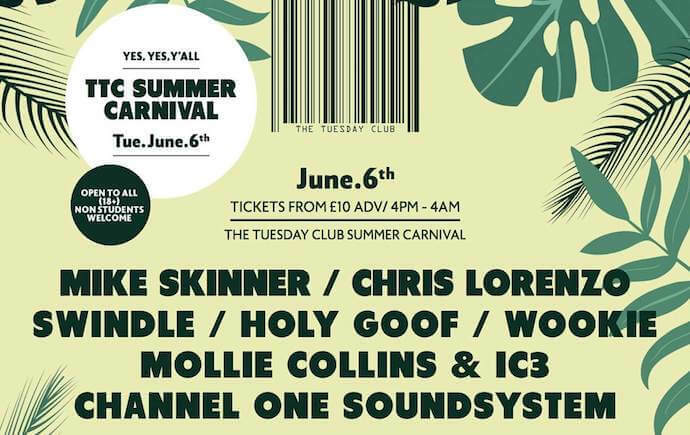 Headlining is the one and only Mike Skinner, whose eclectic DJ sets span hip-hop, trap, garage and of course some Streets’ hits. He’s joined by house-don Chris Lorenzo, dubstep trailblazer Swindle and garage/bassline selectors Wookie and Holy Goof. What’s more, the day party is free entry – where Channel One Soundsystem will be reppin’ the reggae and dub. Check out our interview with Holy Goof here. Dan Shake has had one hell of a ride since Moodymann released his ‘3am Jazz Club’ single on the highly credible Mahogani label back in 2014. He’s done a Boiler Room, started his own label (Shake) and released on Black Acre and Delusions of Grandeur. 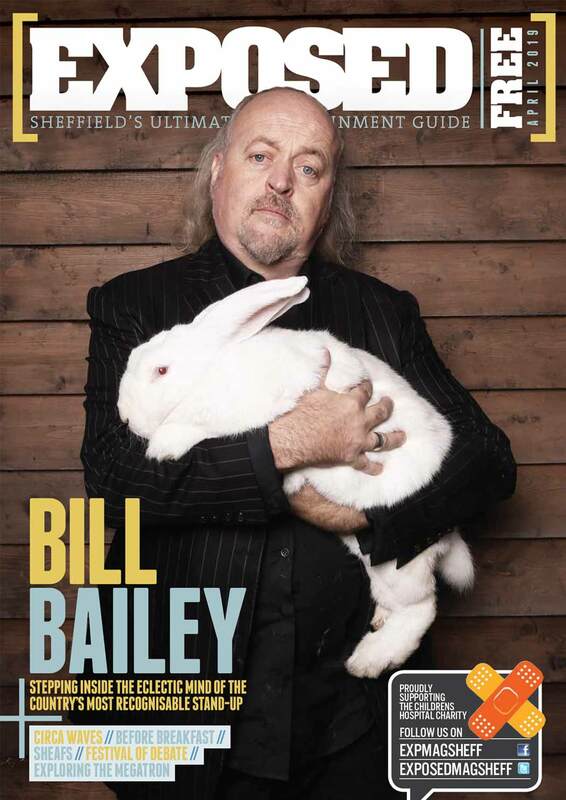 It’s about time he returned to Sheffield and what better place to catch the disco/house don than at The Harley? 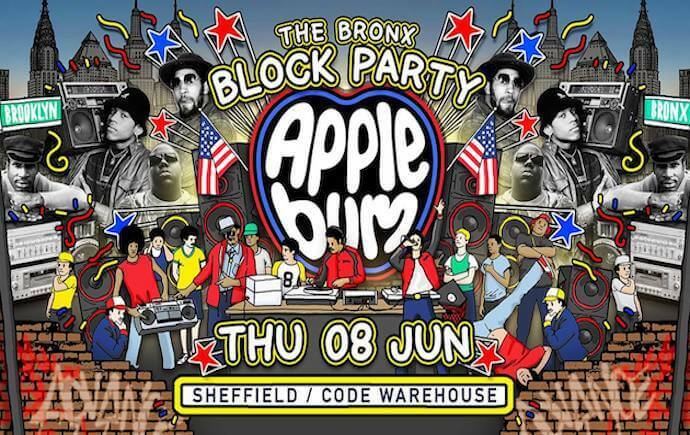 Applebum have been shaking bootys all over the UK, Australia and even Romania with their residents’ hip-hop and R&B parties. and if you’ve been to one of their Harley nights you’ll know the energy is always high. This June they’re hitting Code for a NYC-themed Bronx Party with DJs, MCs and decoration influenced by all things Big Apple; plus there’s even a hip-hop-themed photo booth to enjoy! This 18-hour session of music, art, technology and dancing is the 1st edition of Hope Works’ new festival, the 2nd of which will be this October. Boasting Nina Kraviz as – who will also be doing an exclusive Q & A during the daytime session – the event is spread across multiple venues which will be connected by a free shuttle bus. From live coding, electro-acoustic installations, poetry exhibitions and modular synth workshops, to live performances from breakthrough artists like Kaitlyn Aurelia Smith and Helena Hauff, this unique extravaganza is offering a new and exciting experience for Sheffield and the UK for a very reasonable price. Bluewave’s 90s party returns once more to Theatre Delicatessen on the Moor before it closes, this time with legends DJ Luck and MC Neat doing a set of the decade’s best UK Garage. With three rooms of hip-hop, R&B, garage, funk/soul and live dancers, there’s plenty on to get your nostalgia levels pumping. Following their huge day and night party last June with KiNK, Nice Like Rice are going two better, this time collaborating with Pretty Pretty Good to close the road outside Hope Works for a full-on street party. With live music, DJs, food vendors and a full-on 3 room rave inside as night falls, this is going to be one hell of a carnival. DJs Pender Street Steppers and Jayda G are joined by the mythical Omar-S, whose influence upon house music is second to none, while uber-funky disco band Harvey Sutherland & Bermuda head up the live music. Read more here. Tickets for this one sold out a long time ago, but if you’re lucky enough to blag one you’ll be there for the final party at one of the Steel City’s most beloved venues. Emotions will be running high and with loads of special guests yet to be announced there’s sure to be plenty of surprises in store, alongside the massive Tom Demac Live set, Mella Dee, Medlar and Hesseltime. Tickets sold out: limited availability otd.